What is it? – chuckaBOOM! deftly combines bomb-throwing and puzzle-solving into a unique and challenging 28 level game that tests your mind and reflexes. Who made it? – The game was developed by Tom Vencel of Ninjadoodle.com. How does it play? 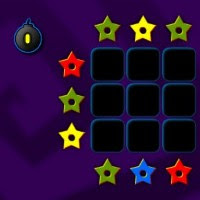 – Each of the game’s progressively difficult levels asks you to blow up a certain number of colored stars. Using only your mouse, you can pick up a bomb and throw it around the screen, and it will explode after a few short seconds. You’ll need to toss the bombs with precision, since you’ll only have a limited number of attempts to destroy the stars required. In addition to gravity (and timing your throw so that the bomb detonates in the right place), you’ll have to deal with environmental obstacles and use various tools to succeed. Barriers come in 3 varieties, smiling bombs can be dragged to reposition them, and cannons can be moved and rotated. Presentation – The graphics are clean and sharp, and while not very detailed, they have a certain charm. The upper-left corner displays useful information about the level, including how many stars you’ve destroyed, how many are left, and the number of bombs remaining. The sound effects are simple and effective, and the music is… funky. Positives – The bomb-chucking gameplay is a lot of fun. Some of the puzzles are deceptively deep and require an exact approach. Since your primary tools are bombs, using them precisely can be like performing brain surgery with a sledgehammer: fun, but difficult. Negatives – The barriers and other unit-types are well implemented, but some more variety would have been nice. Some different backgrounds would also have helped to break things up, visually. Less than stalwart action-puzzle fans may have trouble completing the more difficult levels. Why you should play it – With all the knock-offs and derivatives in the Flash game space, it’s nice to run into a game that’s clever, different, and fun. chuckaBOOM! is all three of these things, and therefore deserves some of your time.